The 16 teams that set off on the road to the final of the FIFA U-20 Women’s World Cup Papua New Guinea 2016 have been whittled down to two, with Korea DPR and France having negotiated all the obstacles in their paths to date. 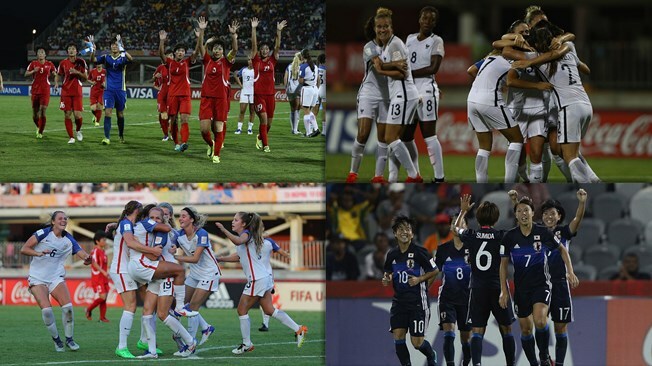 Meanwhile, USA and Japan, the two sides they respectively defeated in the semi-, will fight it out for third place. FIFA.com looks ahead to the final day of the eighth U-20 Women’s World Cup on Saturday, when Port Moresby’s National Football Stadium plays host to two games that will decide which team lifts the trophy and who joins the two finalists on the podium. This match will be a case of déjà vu for the 14 players in both squads who featured in the final of the FIFA U-17 Women’s World Cup Azerbaijan 2012, when the French defeated the North Koreans in a penalty shoot-out. This is an altogether different game, however, with the veterans of that final being joined by a host of other talented names and both sides thinking big. The only team to have lifted the trophy aside from three-time winners USA and Germany, a feat they achieved at Russia 2006, Korea DPR have won all five of their games in Papua New Guinea, scoring 18 goals and conceding only six. A well-drilled, tight-knit unit, the North Koreans will come up against a France side that boasts less impressive statistics, with two of their five games to date ending in draws. Les Bleuettes have plenty of reasons to be confident, however, not least the superlative form of goalkeeper Mylene Chavas and forward Delphine Cascarino, who has been quite lethal in front of goal. Can Korea DPR close the gap on the Americans and Germans or will France add a fourth name to the list of tournament winners? The two finalists did not have it easy against USA and Japan in the last four, with both semis proving hard-fought affairs and going to extra time. After coming up short in their bids to reach the final, the Young Nadeshiko and the Stars and Stripes will look to end on a high by winning the bronze. It promises to be an exciting match. While Japan, who have Yuka Momiki and Mami Ueno in firm contention for the adidas Golden Ball, have been averaging three goals a game, a USA side led by Mallory Pugh have proved adept at scoring late and decisive goals. Korea DPR are a side that make frequent incursions into the opposition box, hitting teasing crosses in behind defenders from both the left and right flanks. If France are to hold them at bay, they will need the talented Chavas to be at her best between the posts. The France keeper has earned widespread acclaim for her fine performances throughout the tournament, and will no doubt be relying on her sharp reflexes and ability to cut out crosses in the final once again. 2 - the number of Korea DPR players who featured in the squad that won the FIFA U-17 Women’s World Cup Jordan 2016 just a few weeks ago: forward Sung Hyang Sim and reserve goalkeeper Ok Kum Ju, who are looking for another winner’s medal in Papua New Guinea.